What is the Trail Volunteer Program? The Trail Volunteer Program offers local trail and greenway users the opportunity to make our community’s park system a friendlier, cleaner, more inviting place to bike, run and play. The program is a partnership between Knox County, the City of Knoxville, the Town of Farragut, Ijams Nature Center and Outdoor Knoxville. Any responsible adult, of any age and ability, is welcome to take part. Volunteers should be willing to commit a few hours each month to visit their specific trail or greenway. Even a small contribution of time will be helpful, and the experience will be rewarding and fun. GREET all trail users and act as goodwill ambassadors for our community. 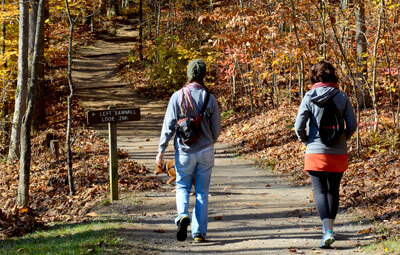 INFORM users about the park and trail system, trail directions, etiquette and rules. ASSIST users who are lost, need bike repair, first aid (when trained) and assist local governments or land managers concerning maintenance and illegal activity. If you are interested in joining the program, we invite you to fill out an application form so we can contact you with more information. Who Makes a Good Trail Volunteer? Common sense and good judgment : On the trails, not every situation can be foreseen; therefore, Trail Volunteers need to be able to make good decisions about what to do and what not to do in a variety of situations. Outgoing personailty : A good Trail Volunteer would be described as a “people person” who is friendly and enjoys helping others. Good communication skills : Trail Volunteers must be able to communicate clearly and calmly about trail safety and respond to questions from trail users. Dependable and self-motivated : After completion of training, Trail Volunteers are generally on their own and expected to fulfill their obligations and responsibilities. Knowledgeable about the local trail system : Trail Volunteers should have basic knowledge of their specific trail and a willingness to keep learning. This includes a basic understanding of trail rules and regulations, as well as the physical layout of the area and an ability to recognize unsafe conditions on the trail. Safety oriented : Trail Volunteers should always think “safety first” and act as good examples to other trail users. Dedicated : Trail Volunteers should have enough personal time to devote a minimum number of hours to scheduled patrolling. Diligent : Trail Volunteers must be willing to complete record-keeping duties.